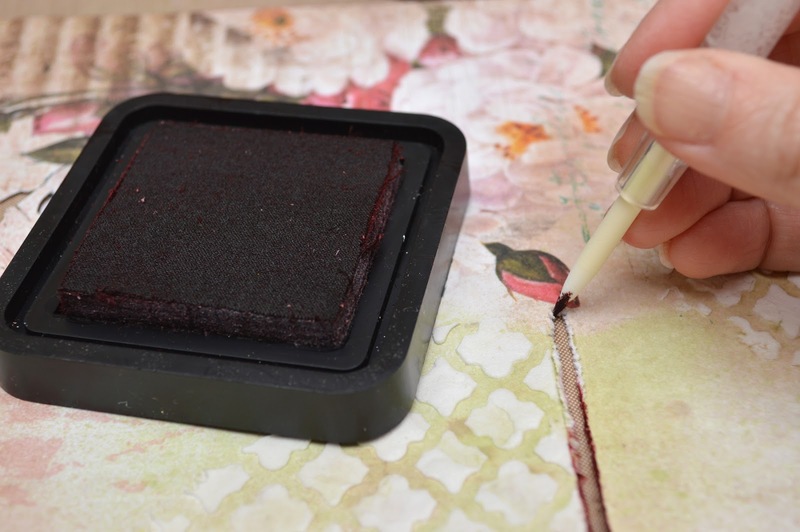 As I mentioned in my previous post, I had the privilege this month of being a guest designer for the My Creative Scrapbook Limited Edition Kit. This was my first time designing and it was a bit of a challenge for me to design for a kit club. 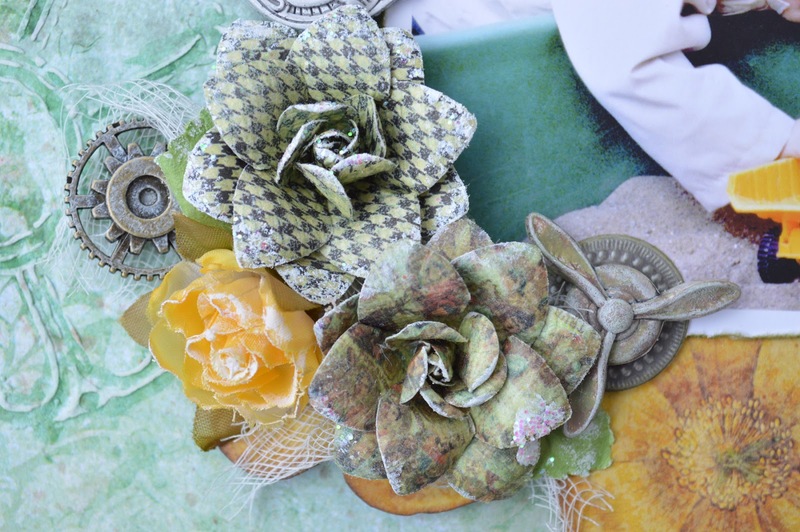 The goal was to use mostly items from the kit to showcase what can be achieved without a lot of additional embellishments. 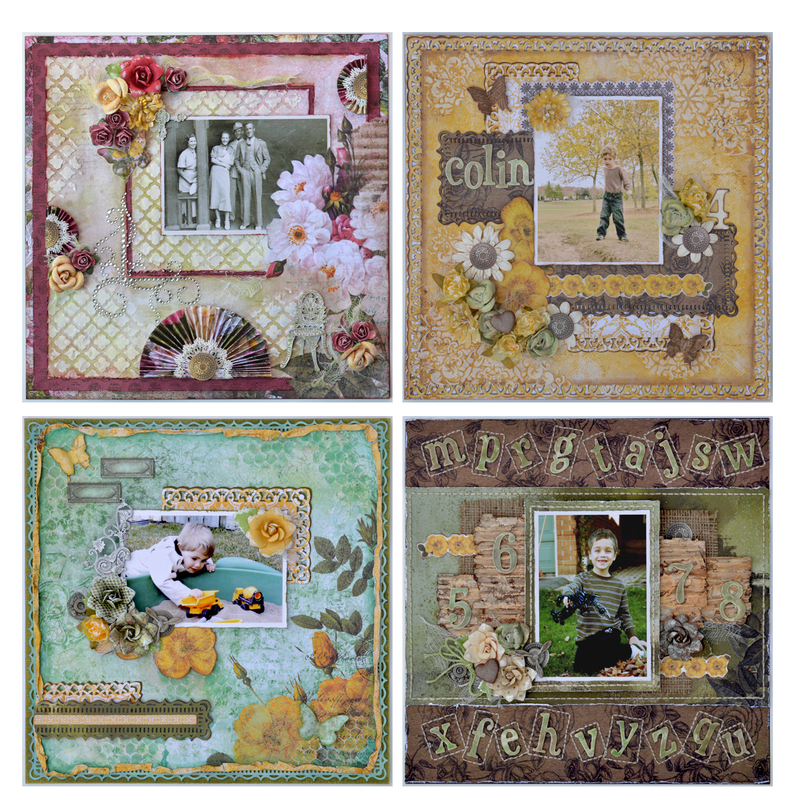 I created the following 4 layouts using the kit, some multimedia supplies of my own (gesso, paint, mists, ink, watercolour paint and pencils), a few plain white flowers, cardboard, cheesecloth, stencils, embroidery floss, punches, a small piece of white string, a little bit of burlap and some plain cardstock. 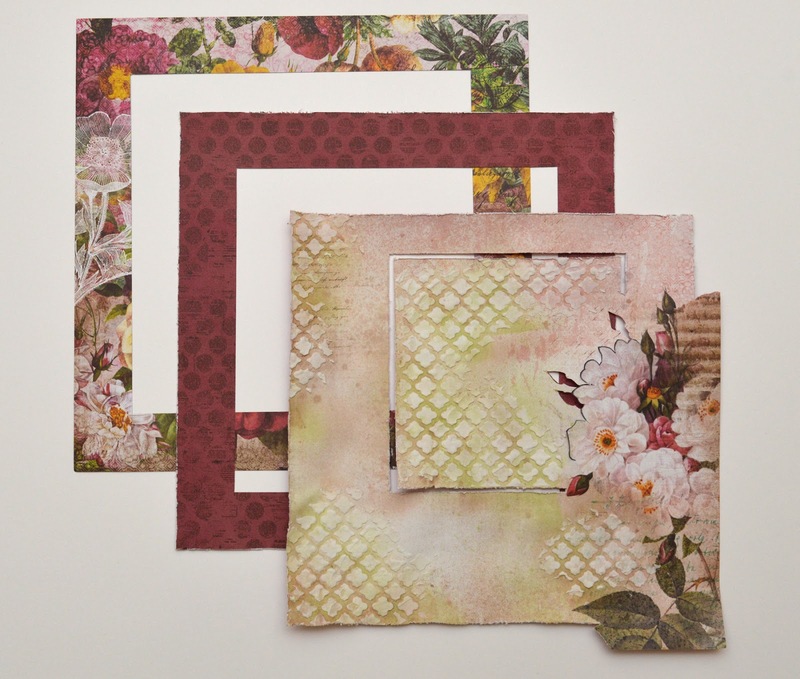 For this layout, I layered 3 pieces of paper from the kit (from the Kaisercraft Be-You-tiful collection). When I trimmed the top layer, I left the floral corner uncut. 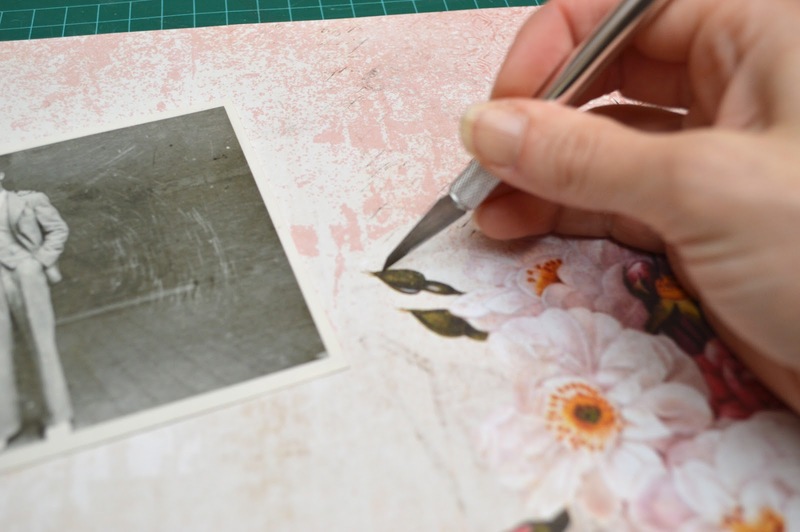 I then trimmed around some of the floral pattern with an x-acto knife in order to slide the right side of the photo underneath. I decided I didn't like the look of the 2 flower buds over the photo and ended up trimming those off later. 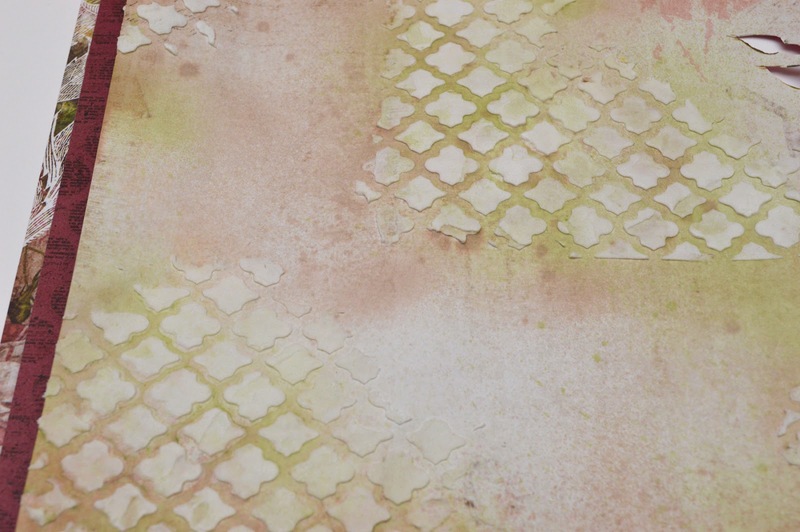 To add some texture, I used molding paste with a stencil from my collection (Prima 6x6 stencil - Lattice), then sprayed over those areas with brown and green mists (Lindy's Flat Fabio mists - Aloha Avocado and South Shore Sand). For a more subtle effect I sprayed those areas with water first and after applying the colour, dabbed off the excess with a paper towel. 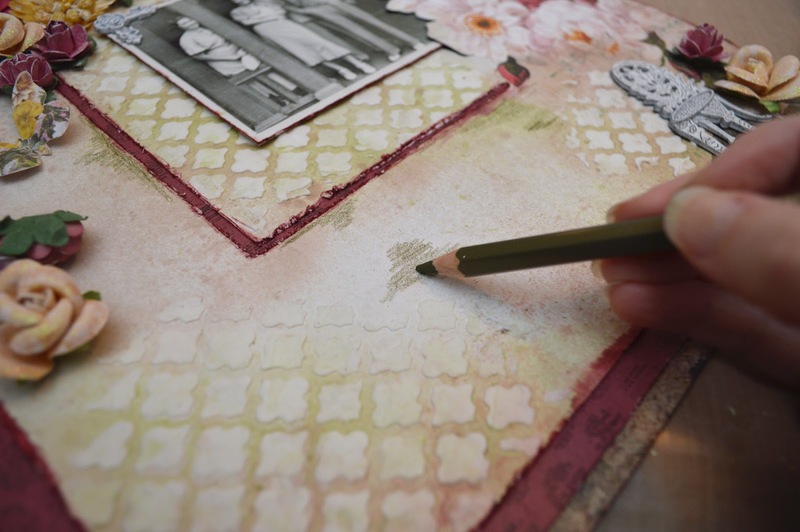 Around the center area of stencilling I cut out a thin frame using a ruler and utility knife, then distressed the edges of the frame, the photo and outer edges of the 2 top paper layers. Before gluing the layers onto a plain piece of cardstock, I cut out the center portions of the 2 lower layers to use later. I ended up putting some of that back behind the cut out frame (initially I was going to use a different colour behind it but decided I liked the red better). I then inked around the edges of the framed area, the outer edges of the top 2 paper layers and the photo with Aged Mahogany Distress Ink. For the hard to reach areas I used a craft nib to apply the ink. I used the paper cut out from the centers of the 2 lower layers to make the fans, cutting it into strips, and scoring them at 1/4" intervals to get nice crisp folds. 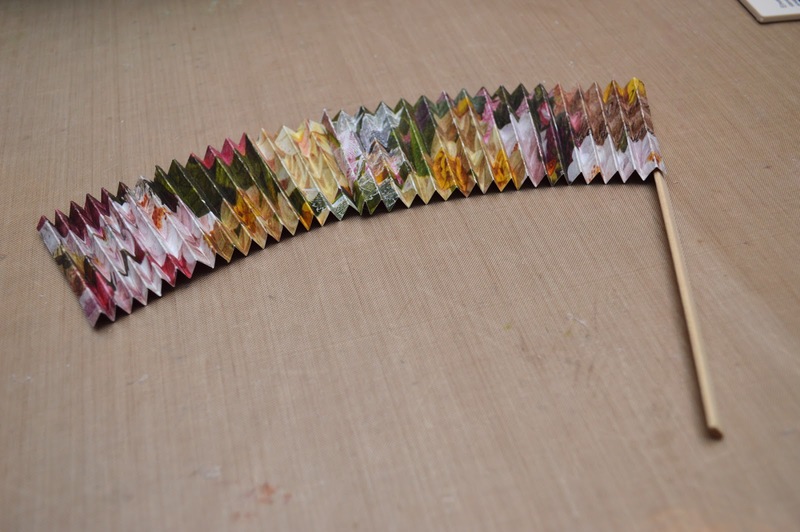 After folding, I glued 2 strips together to make the larger fan and then glued each end to a craft stick cut to the appropriate length (you can also use a popsicle stick split in half). I then pressed the arch inward, adhering this part with hot glue. I snipped the bottom of the white lace from the kit to make it easier to arch then glued it onto the fan and covered the messy looking part with a medallion sticker from the kit. For the smaller fans I used half a medallion sticker. 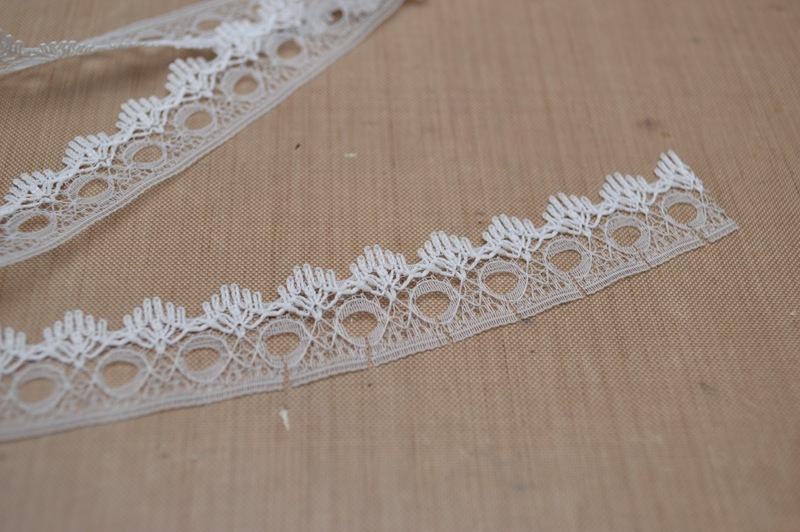 The lace wouldn't sit very flat so I put tiny dabs of glue under the exposed edge to keep it down. 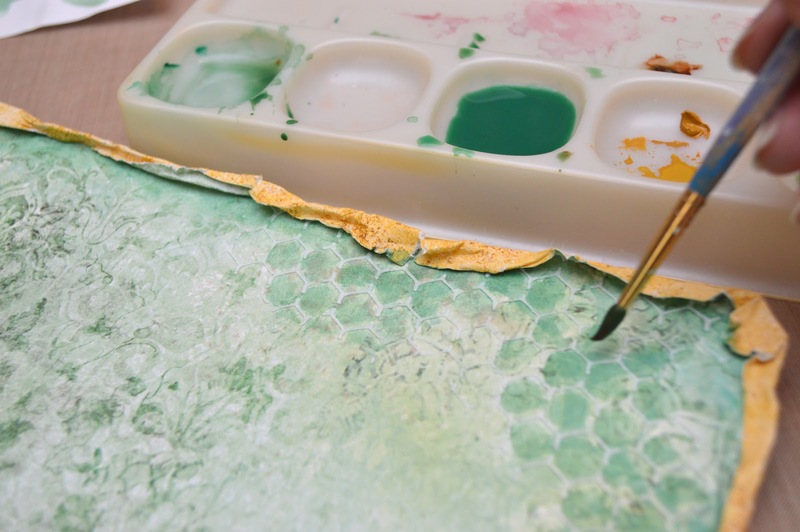 I added a few random touches of green to the paper with a watercolour pencil, then brushed over them with water. 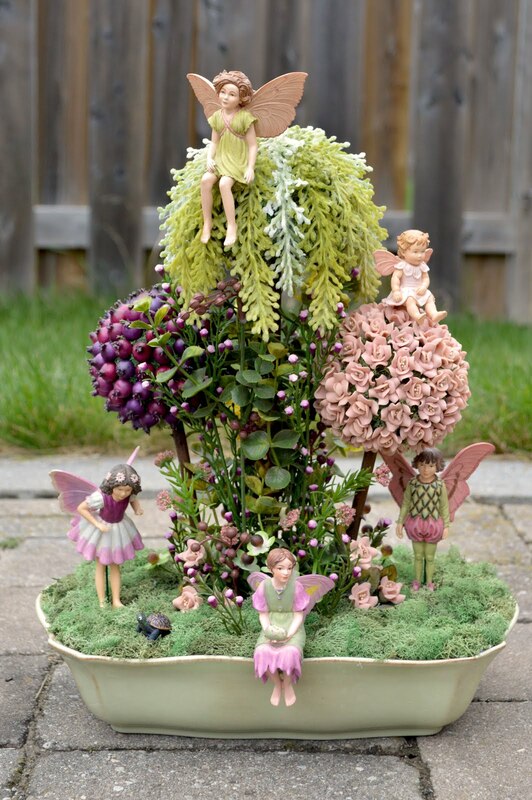 All the flowers I used are included in the kit. I lightly dry brushed white paint over all of them except the larger red rose. 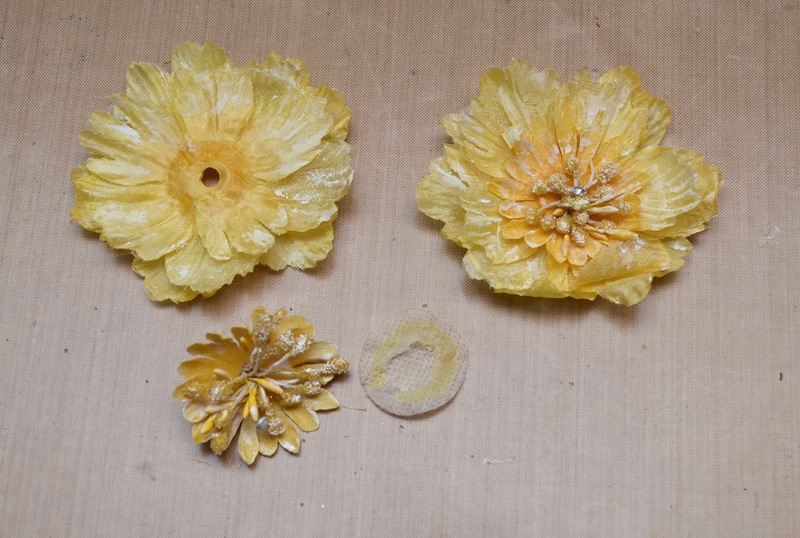 The bright yellow flower with the stamen center was pulled apart from a larger flower in the kit. I trimmed off the long ends of the stamens sticking out the back and re-glued the back to keep the stamens from falling out. The butterfly sticker, metal chair, cross (I modified this with some tin snips) and the rhinestone corner flourish are all from the kit. 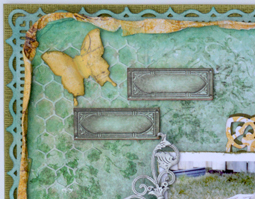 I inked around the edge of the butterfly and lightly wiped some green ink onto the metal embellishments. 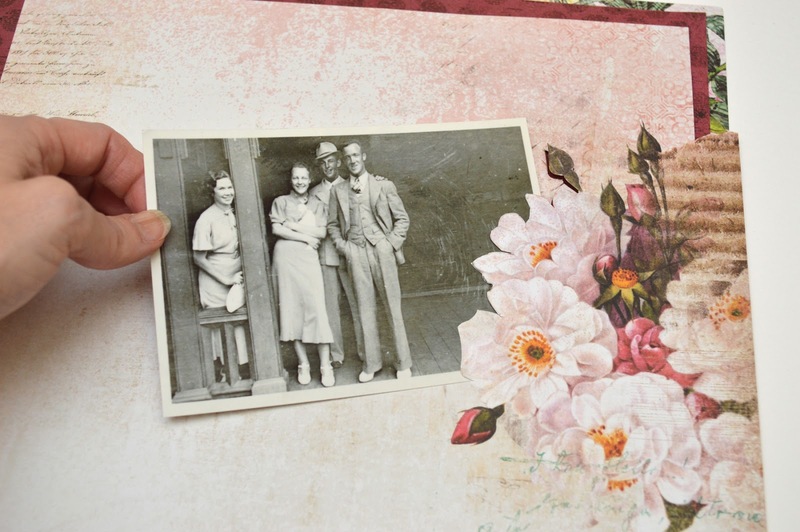 The photo was glued to a piece of plain chipboard to keep it laying flat over the lumpy background. 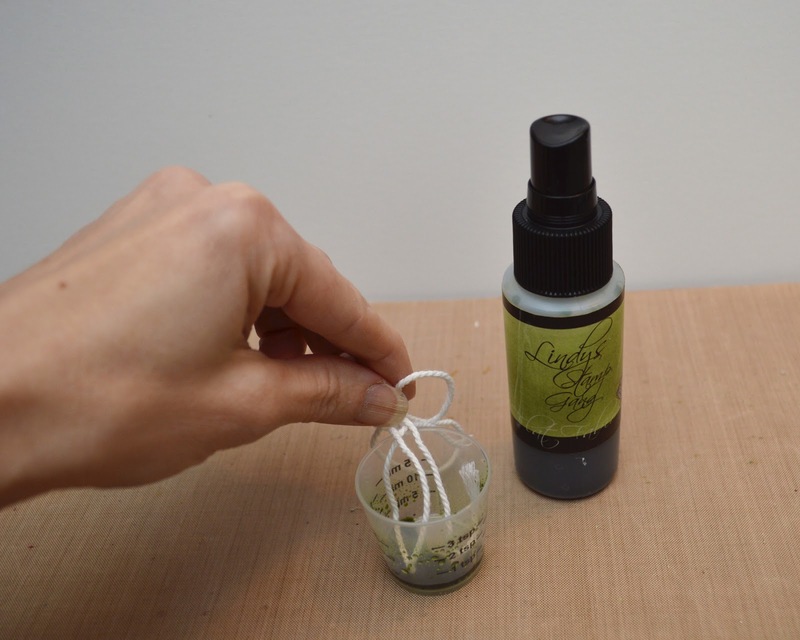 I also added some cheesecloth underneath the flowers, dabbing it with a brush dipped in the green mist used earlier. Then it was just a matter of gluing everything down. 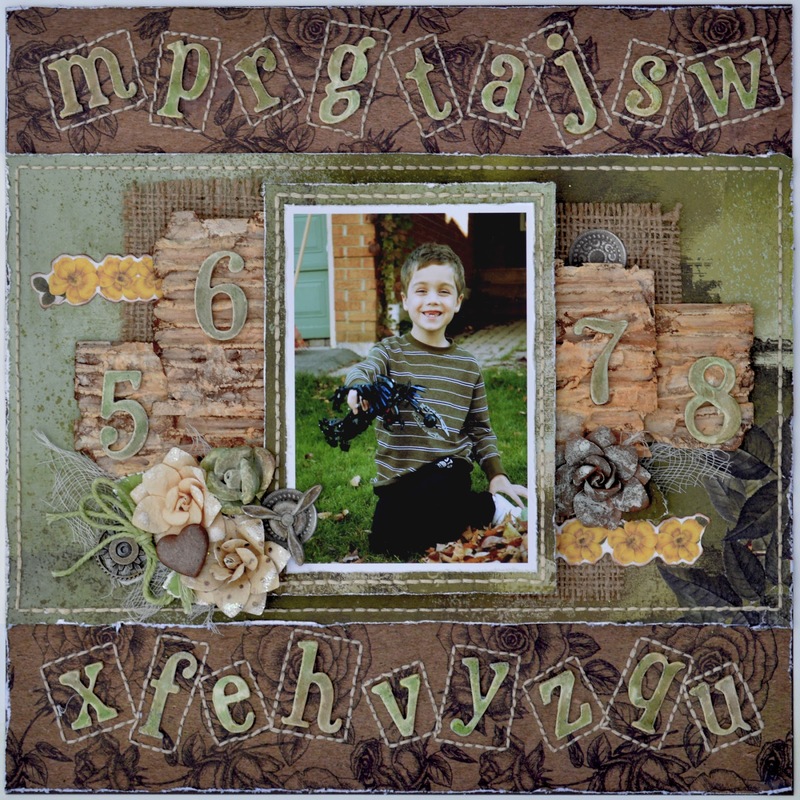 I started this layout with molding paste and stencilling. There wasn't much contrast between the stencilled areas and the background so I added some subtle colour with a brown watercolour pencil to make it more noticeable. I didn't want to spray it with a mist because I thought it would be too heavy and cover too much of the subtle colouring of the paper which I liked. I punched around the edges of this paper and a piece of brown cardstock, then layered them over another piece of paper from the kit. I cut out the center of the back piece to use on the front of the layout. 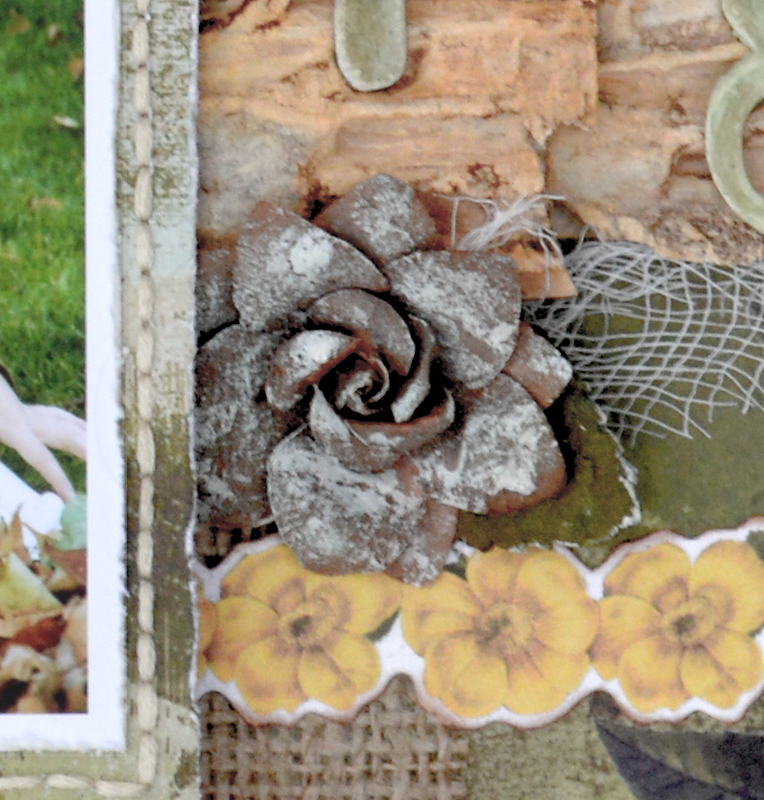 I cut some rectangles out of this leftover piece as well as from the brown floral paper from the kit to layer under the photo. I punched around the edges of these pieces as well and layered them on a darker brown version cut from more of my own cardstock. 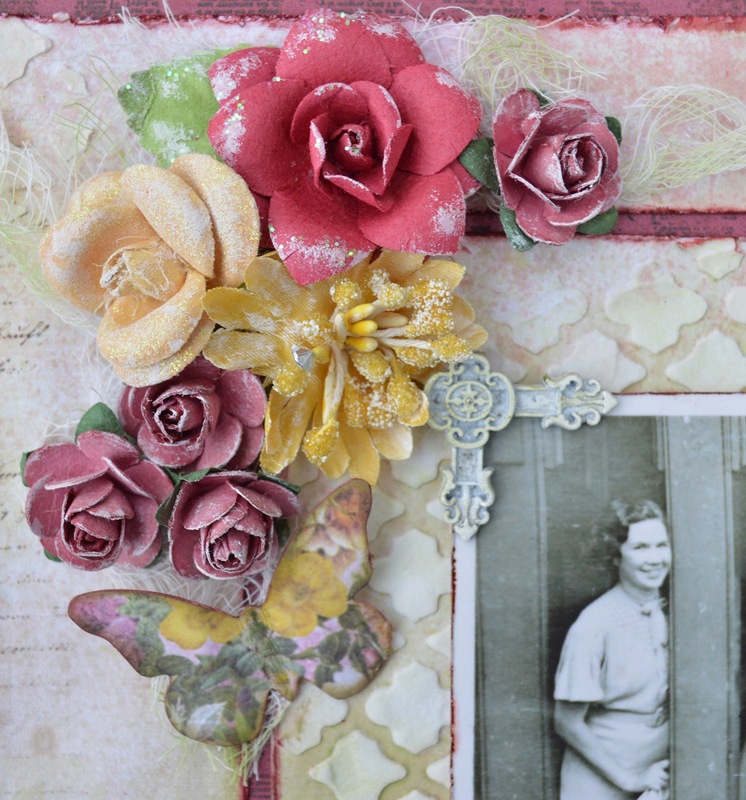 I used some of the yellow flowers from the kit but I felt like there was too much yellow and brown and I needed to add a touch of another colour. Most of the suitably coloured flowers from the kit I had reserved for the next 2 layouts. 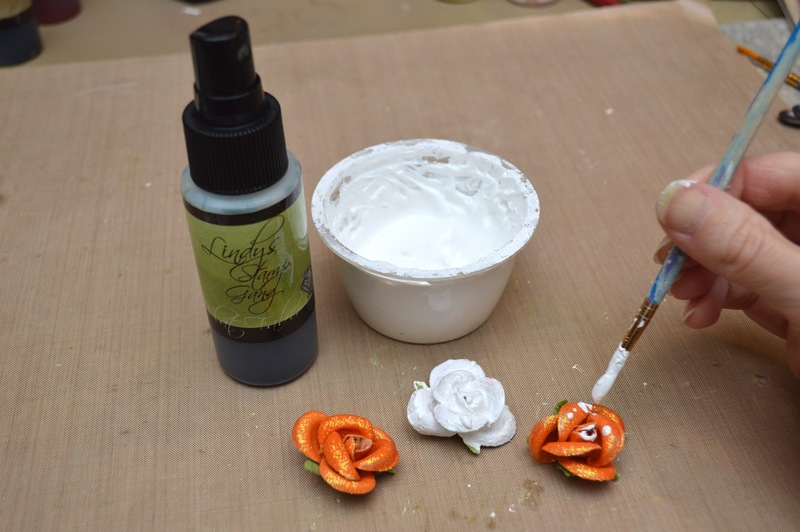 So I took the bright orange and red glitter roses from the kit and coated them with gesso, letting this first layer dry. Then I applied another light coat of gesso and while it was still wet sprayed it with the same green mist I used in my Ladies and Gentlemen layout. 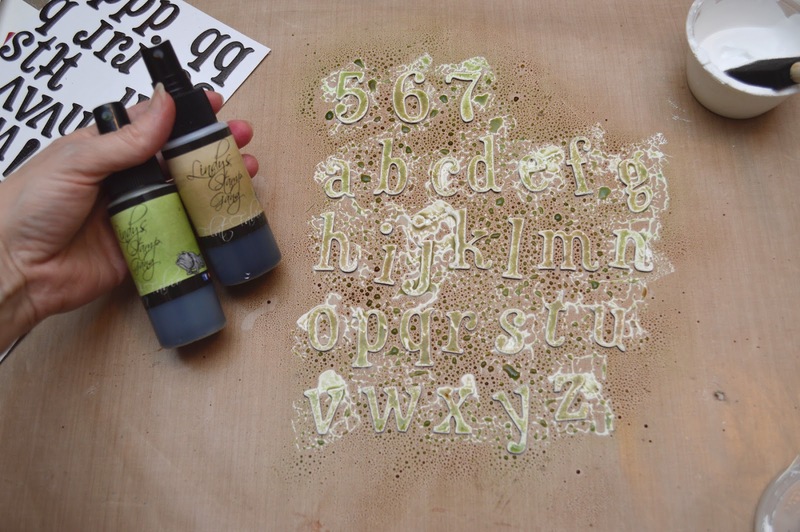 I used the same technique with the black alphabet stickers from the kit, using green and brown mists. For the number 4 sticker, I just painted it white and used my craft nib to ink the edges with dark brown ink. 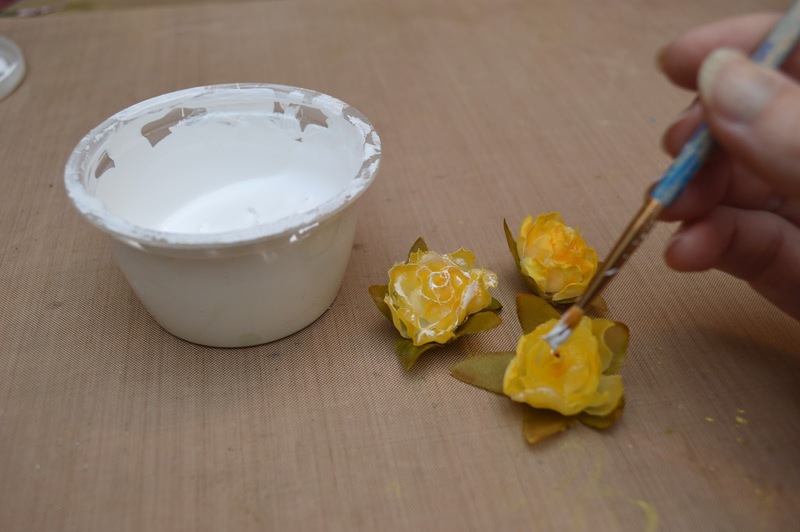 As in the previous layout I brushed gesso lightly over the yellow flowers. 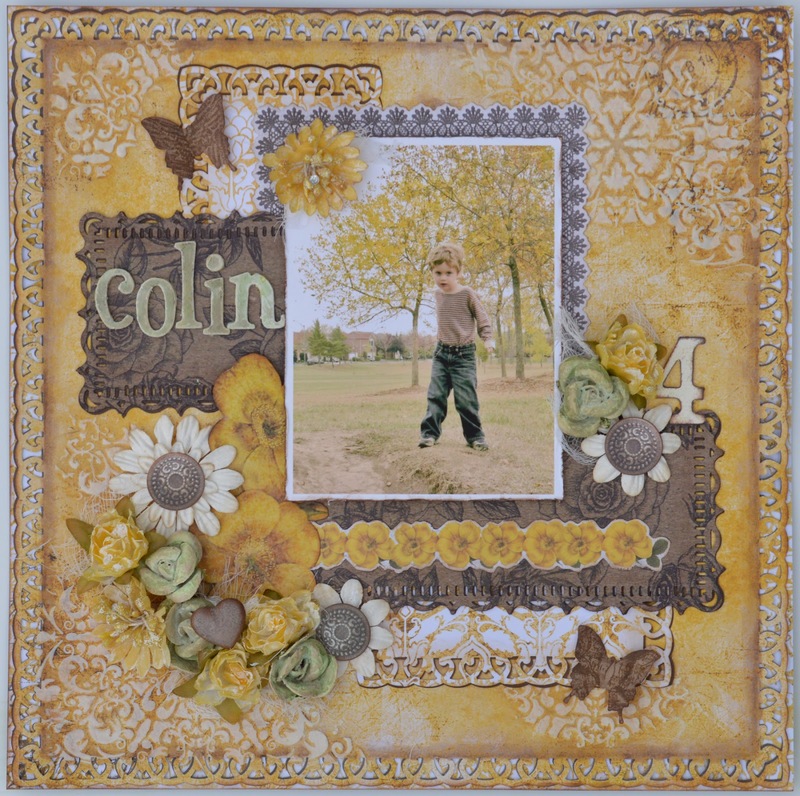 I used various stickers from the kit; the butterflies, the yellow flower border, the brown lacey frame around the top of the photo which I cut and mitered, and the medallion stickers in the centers of the white flowers (the white flowers were from my own stash). 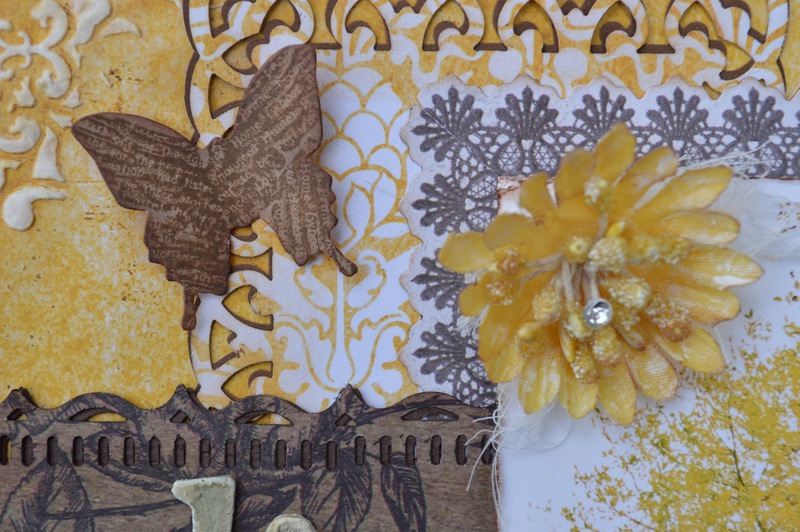 I used dark brown ink with the wing stamps from the kit on the plain brown butterfly stickers. I painted the metal heart from the kit brown and dry brushed white overtop. 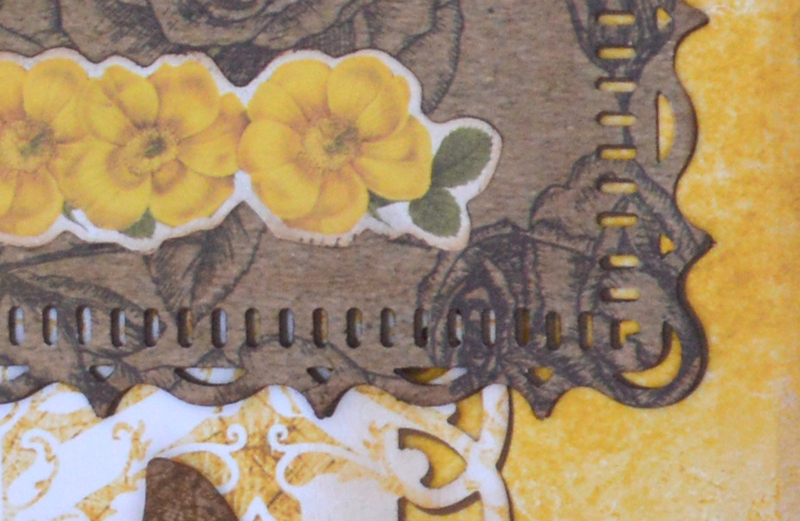 The large yellow cardstock flowers were cut from remnants of the papers used in the Ladies and Gentlemen layout. 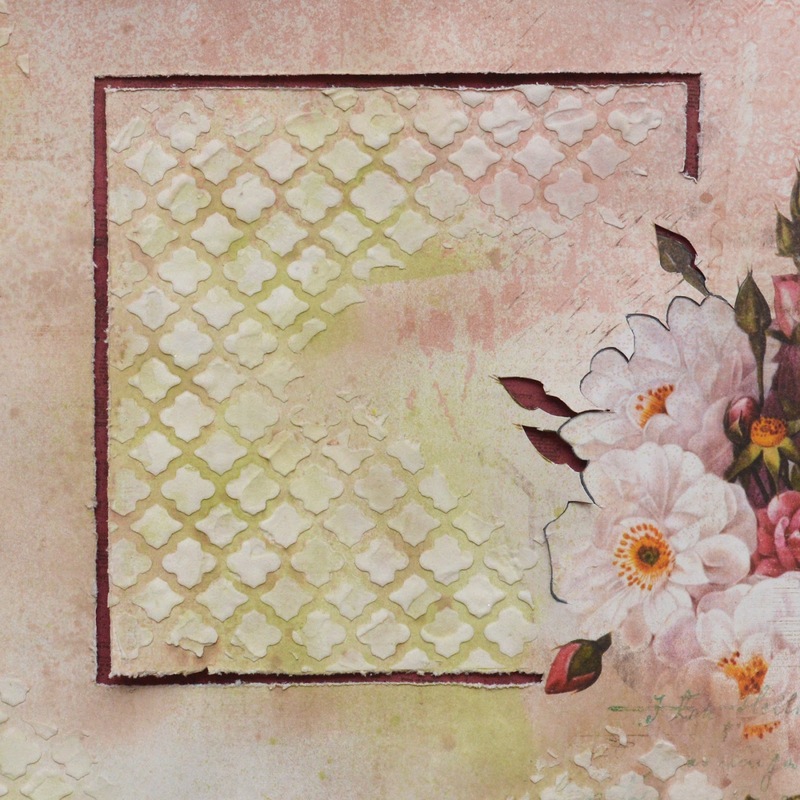 In addition, I distressed and inked around the photo, put some cheesecloth under the flowers, and added some brown watercolour along the inside edge of the punched border. 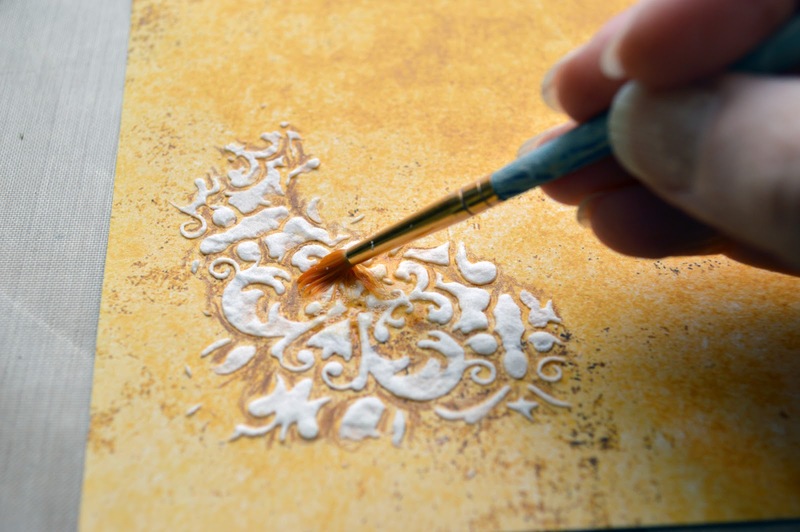 Once again I used molding past and stencils on the background paper. 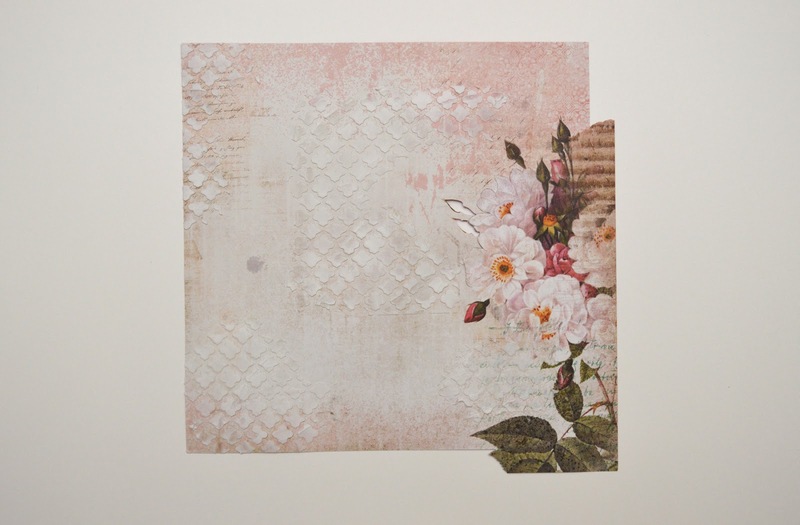 I really liked the subtle shade variations and pattern in this paper as well, so I used stencils that had a lot of open areas to let this show through. 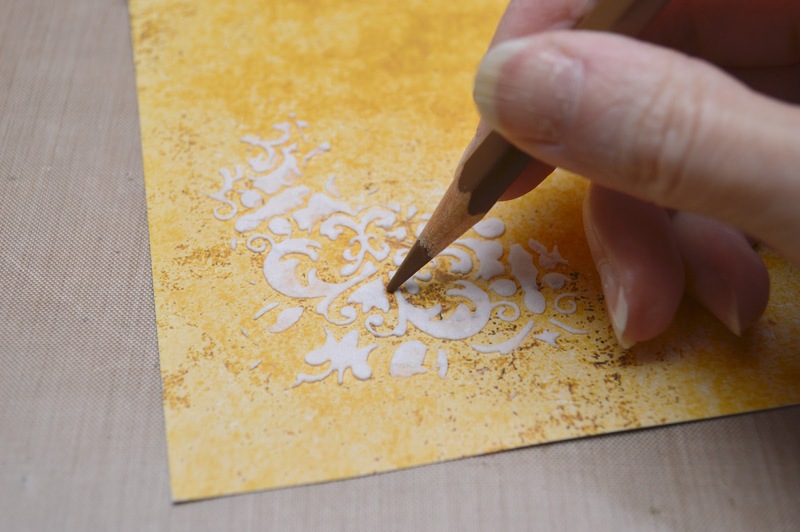 Again the contrast was very slight so I added some watercolour (mixed from viridian and raw sienna watercolour tubes) to get a colour similar to the paper and applied it around the stencilled areas to highlight them more. I also applied some all around the edge of the background paper. 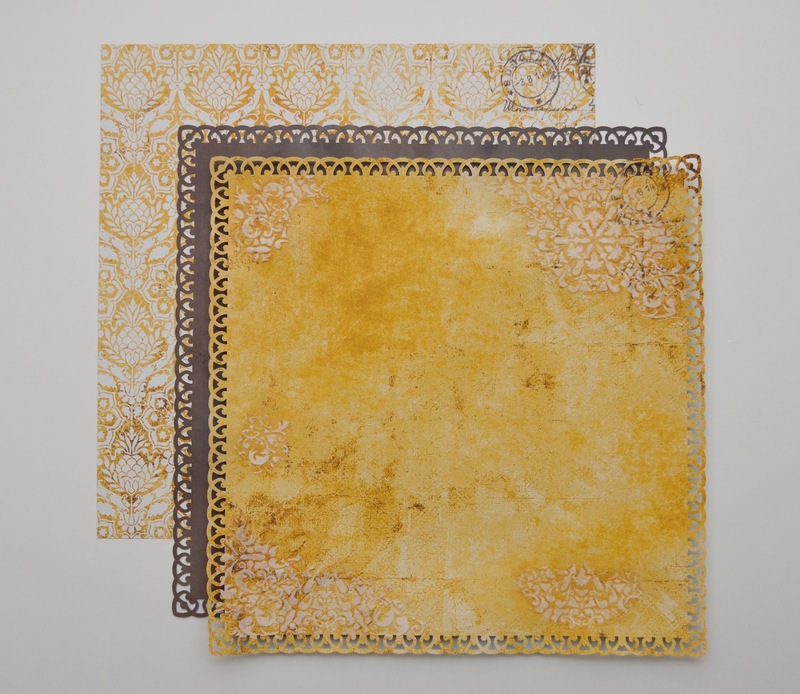 The back of this paper was the same yellow one I used in my "Golden" layout. This matched the colour of the flowers in the bottom right corner on this side so I wet the edges and rolled them over to create a coordinating frame around the paper. 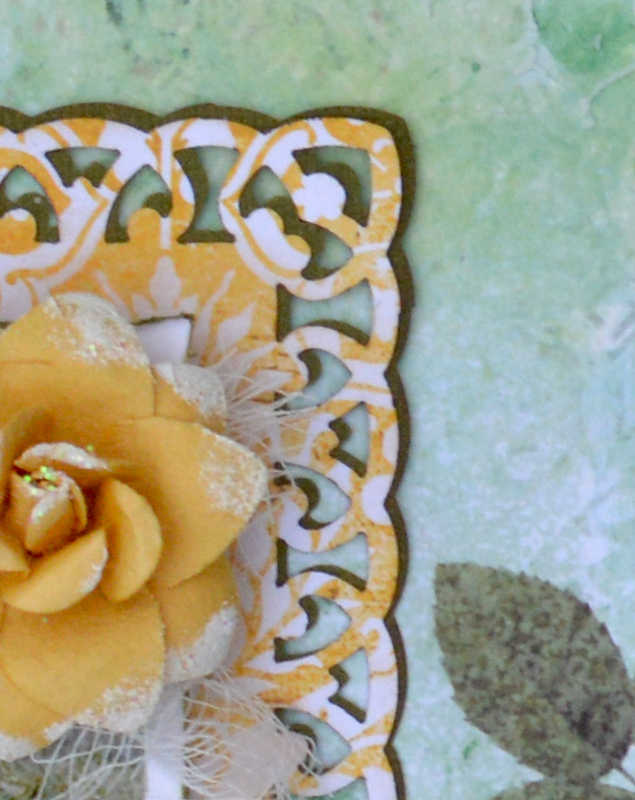 I used 3 punches on this layout with the yellow and white patterned paper and the green paper from the kit. 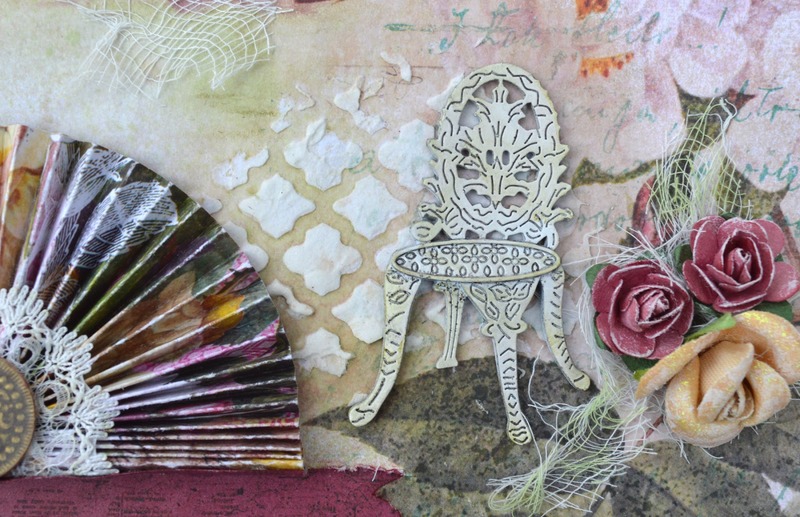 These were Martha Stewart PATP punches ; French Scroll, Flourish Lace and Gothic Lace. 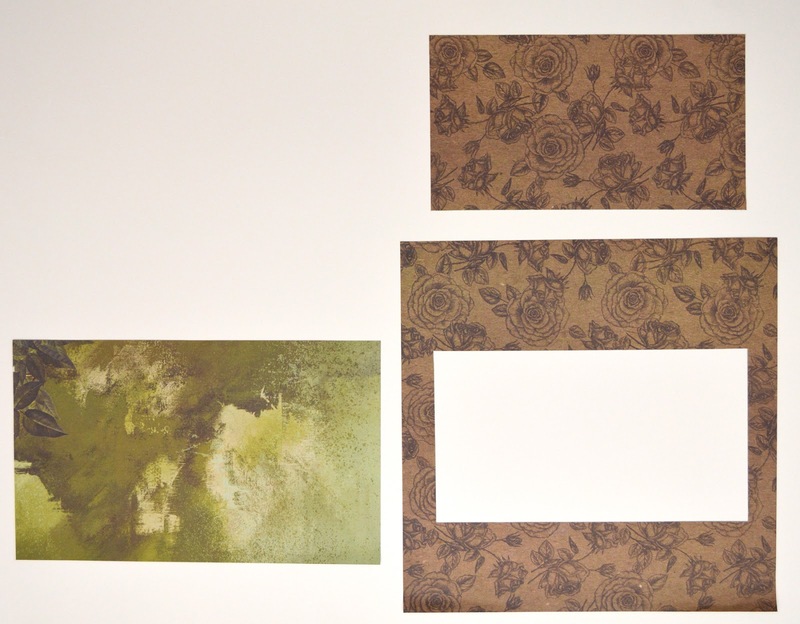 I cut matching pieces in a dark green cardstock to layer under the smaller pieces. 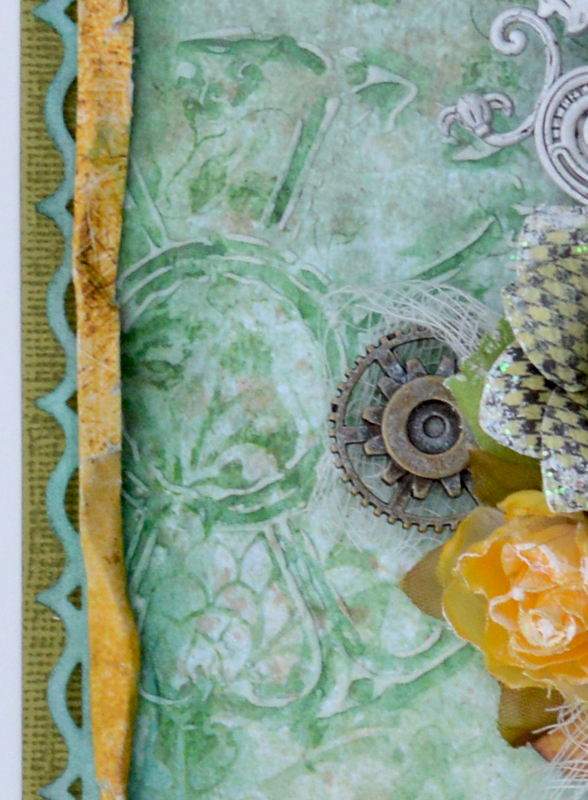 The white and yellow patterned strip in the center of the green punched piece was from the sticker sheet in the kit. 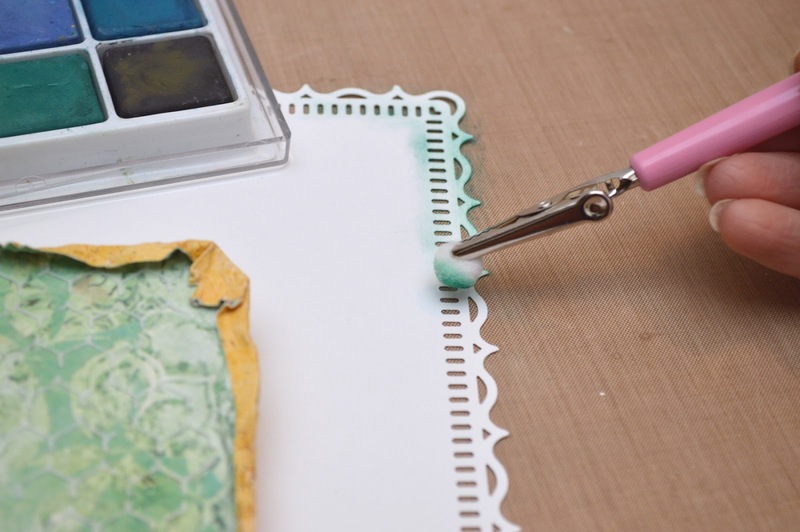 I matted the main background paper onto a piece of punched white cardstock coloured with chalks and a backing piece of green Coredinations cardstock that was lightly distressed with sandpaper. I coloured the edge of the white paper with chalks because I didn't have a colour cardstock I liked or any mists or inks of the right colour. I applied different colours of green, brown and black. 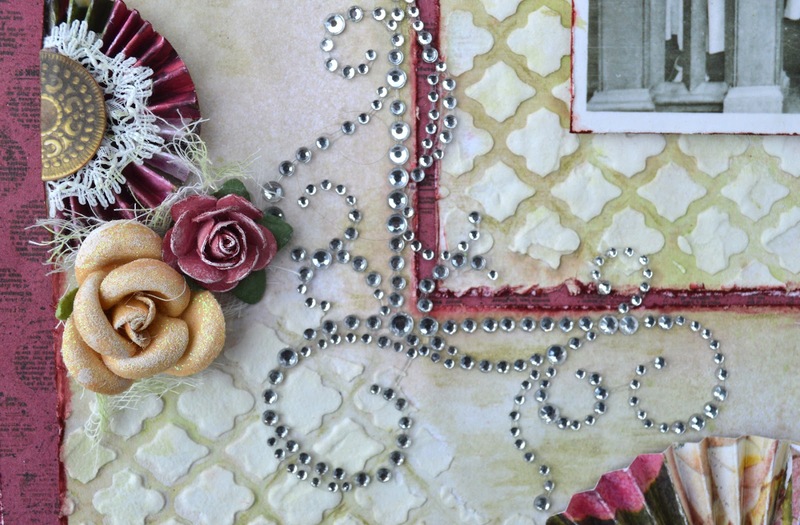 The embellishments (with the exception of a bit of cheesecloth) were all from the kit. 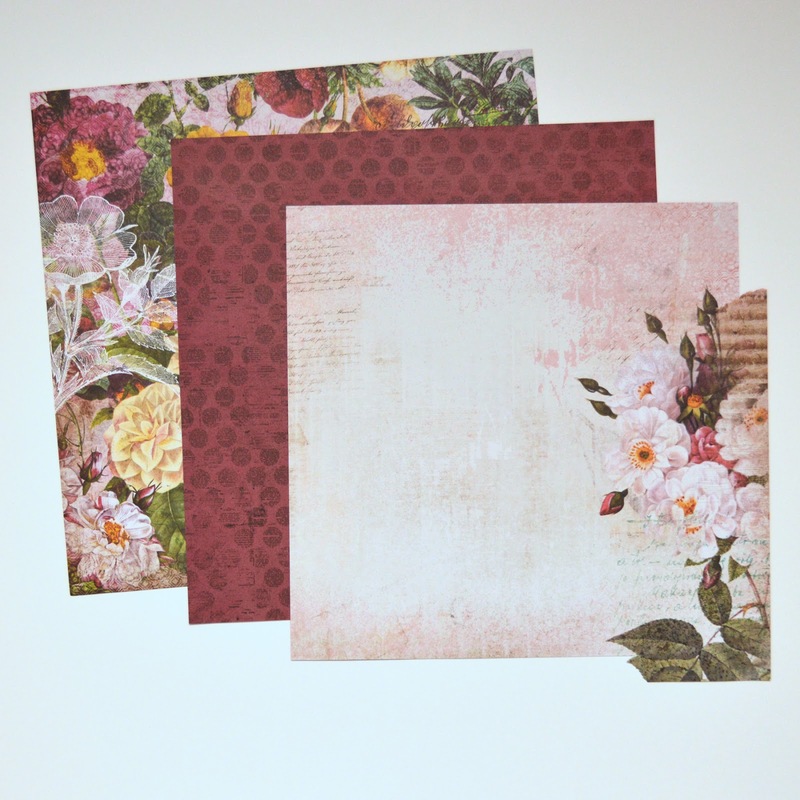 For this layout I used 2 pieces of the same paper from the kit, using the front and back sides. cutting out the center of the back piece to use for the photo mat. The wide green strip in the center was left over from the other layouts where I had used it for some of the punched pieces. I was kind of at a loss with what to do with this one. 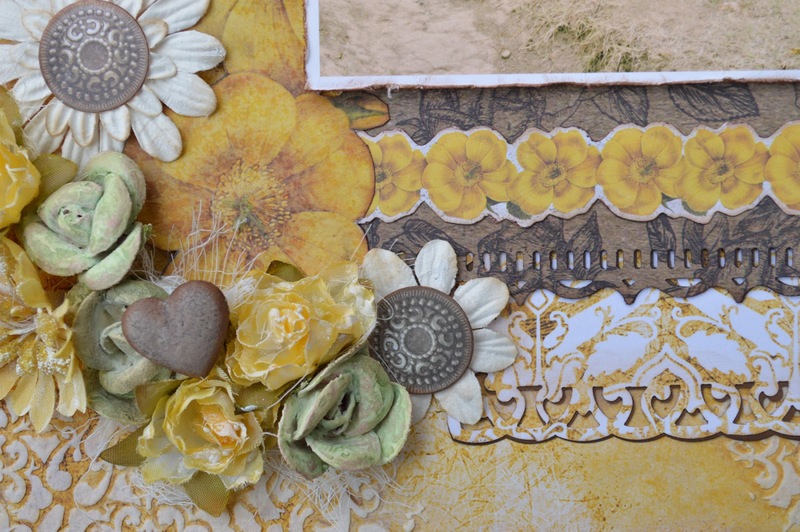 I had used most of the big embellishments except for the yellow flowers and I didn't think their style suited this more rustic layout. I still had a bunch of the painted letters left over from the "Golden" layout and the colour was perfect so I decided to fill up the page with them. 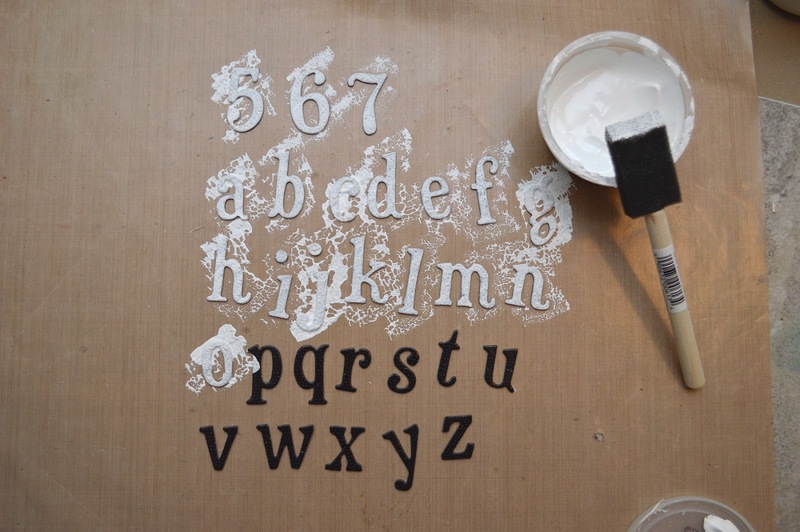 I still have a bunch of unpainted letters left over too because there were 2 large stickers sheets with 4 of each letter in the kit. I had 3 flowers left that worked colour wise (one that I had painted earlier) so I used them by the bottom left corner of the photo. I clustered them with the second gear, heart and propeller that I had painted earlier from the kit and added a piece of string that I coloured with Flat Fabio mist and tied in a double bow. I had a few scraps of burlap in my own collection so I cut a few squares to add some texture and interest, but it still seemed kind of empty. Digging through my stash of scraps left over from old layouts and "experiments" that I had not yet found a use for, I found this piece of corrugated cardboard that I had painted and misted (much like the letters used in this layout but with a yellowy brown paint instead of white as the base) then cut into pieces and never used. 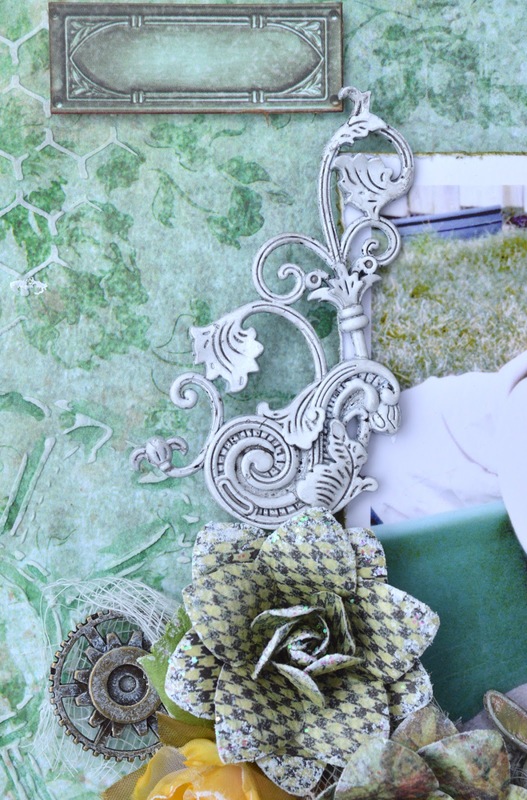 I really liked the way it looked, so I layered the pieces under the photo. 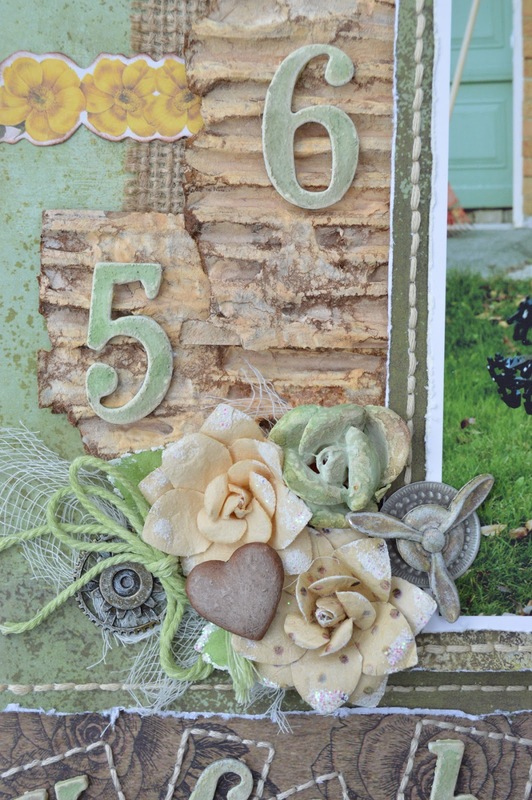 I glued the photo onto a piece of chipboard so it would sit flat over the lumpy layered cardboard then glued layered scrap pieces of chipboard to prop up the second layer of cardboard so it would stay relatively level. I also used some under the mounted photo at the bottom to level it. 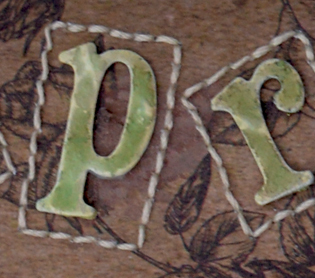 I used a piercing tool with a ruler to punch the holes, stitched around the green paper, and photo mat with embroidery floss and then glued down the letters. Here's where I messed up big time. After gluing the letters down I put the large green piece of paper back on top to see how it looked and realized I had glued the top letters down too far and they would be partly covered by the paper. In hindsight maybe I should have used repositionable glue. 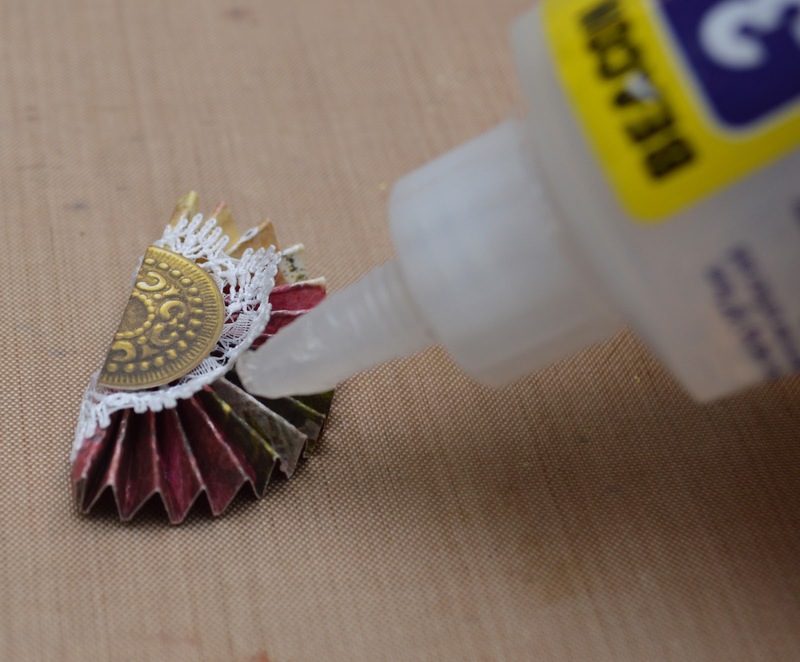 I used Beacon's 3-in-1 craft glue because it sticks really well and I don't get embellishments falling off like with some other glues (they were good and stuck allright). So I pried them all off with one of those thin metal craft spatulas lifting off pieces of the paper and showing the white core in stark contrast. If there was a scrapbooking store near me that sold this line of papers I would have rushed out to get another one, but there wasn't so I had to make do. I mixed up some brown paint trying to get it to match as best I could, then lightly dry-brushed some creamy paint over top of those areas so the colour wouldn't look so flat compared to the paper. The perfectionist in me is still cringing. After that I pierced around the letters freehand and stitched with more embroidery floss. I probably used about 3 skeins worth all together. Then I distressed all the paper edges and glued everything down. I added a bit of cheesecloth (once again), the yellow border sticker and a couple of medallion stickers from the kit. When I was done this, the right side seemed a bit unbalanced and I wanted to put another flower there. Well, there was a peach coloured rose the same style as the other two from the kit but "peach" didn't work so I sprayed it with brown mist, touched up exposed peach areas with brown paint and dry-brushed white (I really like to dry-brush it seems) over top. I think a pale coloured rose like the others would have looked better, but I was trying to use only what was available in the kit so I made do again. Although it was the most challenging of the 4 layouts because I did it last and had less options left when I got to it (and messed it up a bit), I think it is my favourite of the four. Here is another close-up shot. I hope you enjoyed my tutorials today. Tracy - your work is always phenomenal, but now even more than ever after reading all of the details and work you put into these layouts! WOW! You are extraordinary to say the least! I am totally speechless. So many techniques to learn from you. 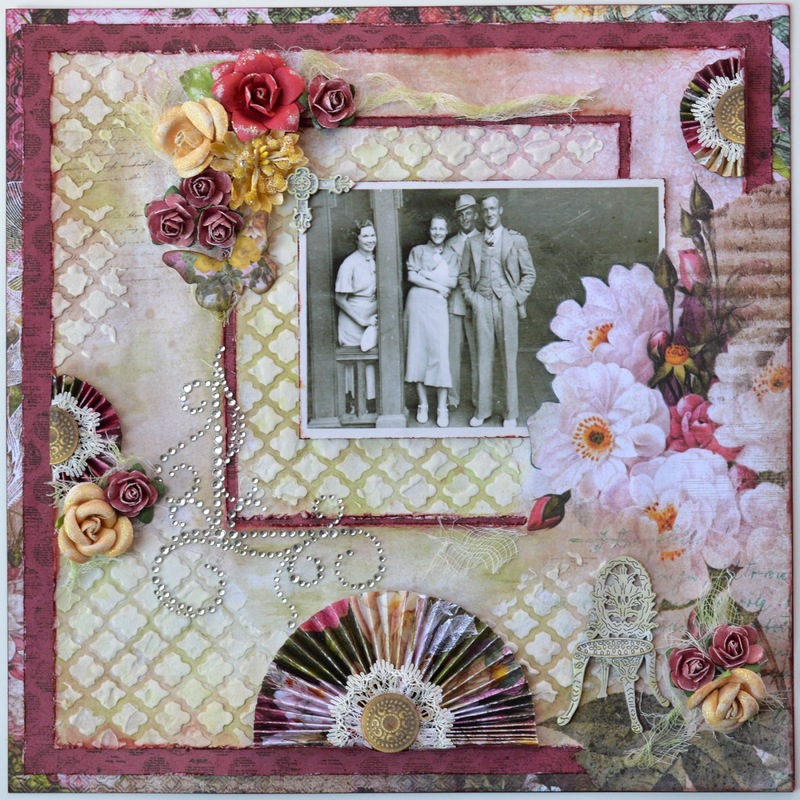 These layouts with all of the matching colors (paper with the photos) and all of the elements used to bring them together just blow me away! Fabulous work! Thanks for sharing the wonderful details! Even though I have no formal art training, you sure have me interested in water color pencils now! So exciting!